Having come from a mainstream background, Purple Stone took Osaka by storm, aiming to heal the soul with their wide range of music from electro-rock to passionate ballads. With a new release due in December 2015, let’s see what they have in store for us. So could you tell us how you came to join Purple Stone? 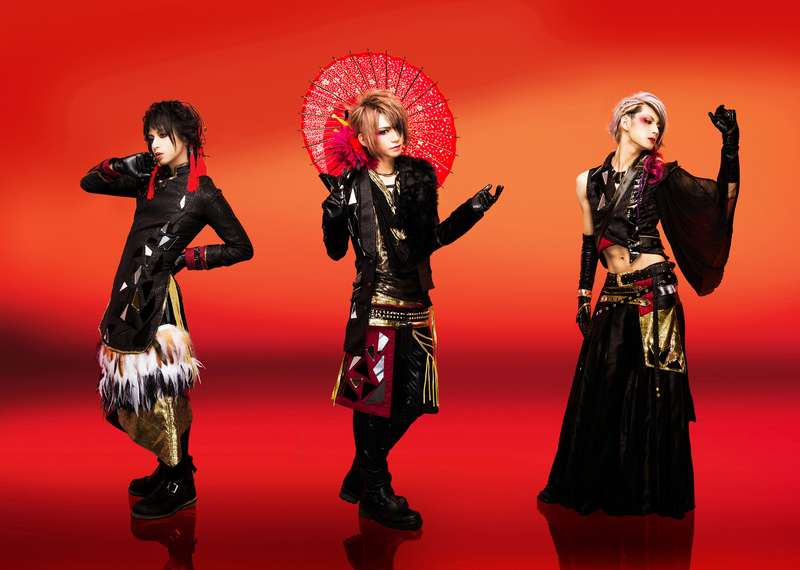 Keiya: Before Visual Kei, we were in a mainstream band. After that band, we stayed together and thought about trying Visual Kei. Actually, Gak had the idea at first because he knew about the Visual Kei music scene, and we all developed an interest in it. We thought about it for a while and decided it would be amazing for us if we could give it a go. What is Purple Stone’s concept? Gak: It’s all about the music and we especially think that the melody is the most important aspect. We really put a lot of emphasis into the construction of our songs when we make our arrangements. So I guess you could say that that’s our concept – we’re all about music as a whole. What’s the origin for the name ‘Purple Stone’? Keiya: Well, ‘purple stone’ literally comes from ‘amethyst’. Long ago, amethysts were considered to be a protective stone and were said to take bad spots of energy and turn it into positive energy. For us, during a live, we want our songs to do the same thing. Certainly everyone is living their own lives and has their own moments of stress or worry, but at a live you can forget all those worries and just enjoy the music together. We want to take negative energy and turn it into positive energy through our performance. So that’s how we came up with the name ‘Purple Stone’. What kind of themes appear often in Purple Stone’s songs? Fuma: Our themes change a lot depending on how we feel at the time. We have sad songs, and we have songs that tell stories, but we do also try to think a lot about how all the songs will interact together at a live performance. We want to give a perfect set list so recently we’ve been thinking a lot about making songs that are simply fun to enjoy during a live concert. We’re currently working on increasing the number of songs that we have that can do that. Where do you get your inspiration from when you’re making songs? Gak: It differs depending on the song. Keiya: Yeah… we have lots of different areas of inspiration. Gak is usually the main source though. Gak: I often take unheard of songs or songs I make myself and change them within me to produce new sounds and new music. What about you, Keiya? Keiya: Ah, for me it’s usually during my daily life that things come to me, most often when I’m relaxing. I like to record during those times, or write down my ideas. Fuma: Sometimes I’ll just sit down and BAM!! I’ll record something. But actually a lot of the time ideas come to me when I’m in the bath, particularly melodies. Then we get together and make the songs. To be honest, I’m more likely to have something come to me when I relax, though. What song would you want people to listen to within Purple Stone’s repertoire? Keiya: We have the announcement of our new single today so I would like everyone to hear that new release. It’s coming out on 9th December 2015 and I think we’ve really put a different aspect of Purple Stone into that song. I really like the song that comes with it too, so I’d really like people to listen to it for me. But if you’re talking about the songs we have out now, I really like ‘Amazuppai Mango’. Gak: For me, I really like our 3rd single as well; but, within our current songs, I really like the song ‘Blame’. We always play it at lives and I think it really helps our fans become one with us and our music. Fuma: They’ve kind of said all of the songs I personally really like, but I also really enjoy our first live-house single ‘Scar’. When we play it live, everyone really gets into it with the head-banging, so I would really like people to come and experience that for real. What kind of genre would you like try? Keiya: I really want to try something acoustic. We’ve never really done it, so it would be something different. Gak: I really want to try and mix our band sound with hip-hop music. I really want to make something as unique as that. Fuma: I also want to try something acoustic because we have so many more intense, upbeat songs. I’d also really like to try a ballad within the genre of J-Pop. I think that Keiya’s voice would lend itself very well to that kind of music, so I want to give it a go. So let’s talk a little more about yourselves. What have you become interested in recently? Fuma: What? What have you done? Gak: It’s really recent but I’ve taken up jogging. Gak: Yeah, in the middle of the night. Midnight jogging. Keiya: Recently, I’ve really come to like Shojo Manga. Quite a lot of it. Fuma: I’ve become obsessed with brown rice before it’s been processed. –laughs- It’s really, really good for your health. Fuma: Music itself isn’t really living or not living, but it is the meaning of my life. –laughs- short but sweet. Gak: To me it’s something people can share. –switches to English- share. Fuma: -in English- yeah, share. Keiya: It’s my whole self and my soul. It’s my chosen road. Gak: -english- the endless road. If you were taken to a deserted island, what three things would you take with you? Fuma: What?! Why? Couldn’t you find it? Gak: I have absolutely zero confidence that I could find it myself, so I’d take water. And an acoustic guitar. Fuma: You sound like you’re planning on enjoying this. Fuma: Yourself? Are you planning suicide? Gak: -and then when it’s found, it would be pretty dramatic. Fuma: So even though you took water, which suggests the will to live, that isn’t really the case. Keiya: I’d take some sort of light, a change of clothes, and one friend. Fuma: Are you treating them like equipment? Gak: It’s for his mental health. Keiya: Yeah, for emotional support. Where would you like to go overseas? Keiya: New York. I’ve been once before, but I didn’t really see all that much so I want to go again. Gak: I want to go to Los Angeles. It’s metal. -makes metal sign- For the rock. Fuma: We’ve all decided on America. I’d go to Oregon Vortex, for many reasons. Fuma: We’re active inside of Japan so you can only really hear us online on sites such as YouTube, but if you do get the chance to come to Japan, please don’t hesitate to come and see us live. We’d be really happy to see you. We can only give you our music through YouTube, but if you would listen to it all for us, if that’s all you can do, we would be really happy then as well. Gak: We want our music as Purple Stone to start growing out there in the rest of the world so please, get our CDs and listen to them for us. Let’s spend a wonderful time together, even though we’re so far apart. Keiya: In Purple Stone, our lyrics are also really important to us because Japanese has a lot of beautiful words, so if you could look at those lyrics in English, or translate them for us, I think it would be really fun. It’s difficult to do it but, if you really want to, don’t hesitate to translate them. Please.